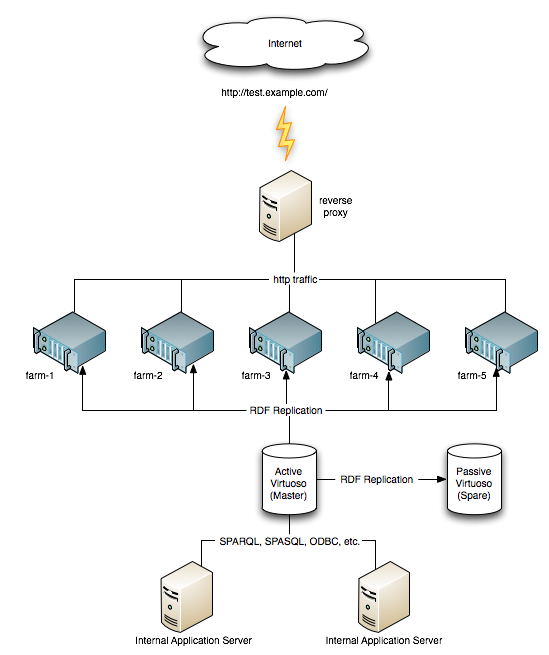 In this document we will examine a proposed setup for a back-end server called MASTER which publishes a number of graphs to a set of front-end machines called FARM-1 .. FARM-n and discuss a couple of common scenarios like adding an extra machine to the farm, or replacing a broken instance of MASTER. In this example we will assume each virtuoso instance running on its own machine, so they can use the same port numbers for both the main server (default 1111) as well as the http port (default 8890) as each machine has an unique IP addresses. In the example we use MASTER-IP and FARM-x-IP which should be replaced by either the real IP address or the DNS name of the machine in question. Since there will be a reverse-proxy service in front of the farm, all virtuoso instances should have the URIQA Default host set to the outside name for this service. In this example we will use http://test.example.com as the web service we are trying to setup. The partition should be big enough to have room for the Virtuoso binaries and libraries, the transaction logs, backups and, if you do not want to use the striping feature of Virtuoso, it will need to have room for the main database files as well. The MASTER machine is the back-end server machine. Various applications feed SPARQL data into this machine it publishes a set of graphs using RDF Replication. The MASTER machine should ideally be equipped with multiple redundant disks in RAID-1 or RAID-6 mode to minimize the risk that a single bad disk takes down the system. From a Virtuoso point of view we will use a combination of online backups combined with checkpoint audit trail to backup the content of the database in a safe way. The online backups, the checkpoint audit trail as well as the replication logs can also be copied to secondary storage using the rsync command and can be easily scripted as a cron job. Once the MASTER is started using the bin/virtuoso-start.sh script we must enable RDF replication before we start add data to the graphs we wish to replicate, so every record is accounted for by the replication process. If there is existing data in the graphs to be published, then this data would need to be added to a subscriber manually since the replication process creates a delta set of changes since publishing was enabled. NOTE: Since the database is constantly modified during operation, it is of NO use to backup the virtuoso.db using an rsync script unless the virtuoso instance was shutdown beforehand, or certain extra precautions are taken which we will explain later on. The SPARE machine is a replica of the MASTER machine. This machine subscribes to the publication of the MASTER to keep an exact match of the RDF graphs, but also publishes this data without any initial subscribers. The SPARE machine should ideally be equipped similar to the MASTER machine, with multiple redundant disks in RAID-1 or RAID-6 mode to minimize the risk that a single bad disk takes down the system. From a Virtuoso point of view we will use a combination of online backups combined with checkpoint audit trail to backup the content of the database in a safe way. The online backups, the checkpoint audit trail as well as the replication logs can also be copied to secondary storage using the rsync command and can be easily scripted as a cron job. We must enable RDF replication before we start add data to the graphs we wish to replicate, so every record is accounted for by the replication process. If there is existing data in the graphs to be published, then this data would need to be added to a subscriber manually since the replication process creates a delta set of changes since publishing was enabled. The FARM-1 machine is the first front-end server machine. It subscribes to the publication of the MASTER instance to keep up-to-date. The FARM-1 machine can be run on simpler hardware than the MASTER instance.It does not require the same level of redundancy in terms of hard disks etc, as there are a number of these machines running in parallel each capable of returning results to the proxy. If one FARM machine dies, it can simply be taken from the reverse-proxy list, repaired or replaced with a fresh machine before it is added to the list of servers in the reverse proxy. As such it does not need to be backed up separately, although we could make a backup of this installation to quickly install the rest of the identical FARM boxes. At this point we can shutdown this Virtuoso instance using the bin/virtuoso-stop.sh command and make a copy of the whole virtuoso installation as a blueprint to copy to another FARM-x machine. We can repeat the same steps we did for the FARM-1 machine, and just make sure we use FARM-2 as the replication name in the database/virtuoso.ini file and use FARM-2-IP:1111 as an argument to the isql program. Extract the tarred/zipped copy of the installation made at the end of the setup of FARM-1. If the system has been running for some time, it may not be practical to do a replication from start, so there is an alternative way to setup a new FARM-4 machine. We can either restore the blue-print backup we make at the end of FARM-1 installation, or we do a fresh installation of virtuoso on the FARM-4 machine. In both cases we shutdown the virtuoso instance and remove the database, as we are going to replace this.